Friday’s post on the blog “Reflections by Kathy” here stirred childhood memories about my late mother’s summer canning activities and helped me relive slices of my childhood. Kathy has an ability to articulate personal history and the cultural backdrop of her experiences in vivid detail. Her words and photos often trigger memories of my own experiences and my reactions that I had long forgotten. Kathy’s remarks about canning pears brought to life summer and winter scenes. Every summer my mother "put up" jars and jars, both pints and quarts, of fig preserves and pear preserves. To prepare the pears for canning, she sliced them into fairly thin pieces of about one to 1.5” long. One of my favorite things for a winter breakfast as a four-year-old (maybe even younger, too) was buttered toast Mother made in the broiler of the apartment-sized gas stove in our small house. She would dot the bread with pats of butter, slide it in and check often to be sure the unbuttered areas were toasted no darker than a golden brown. I would be sitting at the kitchen table, basking in the oven's warmth. Mother would spoon those home-canned bite-sized pear preserves and the accompanying heavy syrup onto the toast. I would eat the pears off the toast first. The next part was what had kept me in a happy frenzy of anticipation while she moved through the toast routine. I would nibble slowly and methodically, prolonging the ecstasy of eating that buttery toast soaked with the sweet pear syrup. Thank you, Kathy, for reawakening the tastes, aromas and secure feelings of childhood moments. And thank you, Kendra, for the picture of pear preserves that look sliced exactly like my mother's. The color of the lighter jars looked like hers. I assume the darker jars are the glaze mentioned in your post. Even the pears in the photo look like the ones we picked from the tree in front of my Uncle Preston and Aunt Evelyn’s house when I was a youngster. 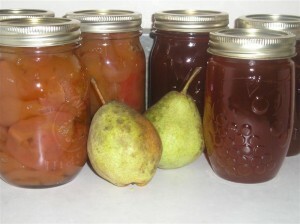 I found Kendra’s blog, "New Life on a Homestead," in my search for a photo of pear preserves that matched my memories. Her personal story on the “About Kendra” page here was captivating to me. I foresee sampling more than pear pix from her posts in the future. Times are tough so I couldn't splurgel. I made the jelly but the grapes were from Virgil. I used to do a lot of canning and preserving. I miss the fruits of my labors. I'm so enjoying your entries about your recovery. Yup, even I, who can be death to folks who make writing errors, have to give in with humility to my errors with a smile these days. My memory has gotten even worse, perhaps with lots of small tia's, and your days leave me smiling, encouraged. That's an interesting way to make buttered toast, especially if one has a large family. I have never tasted pear preserves, but would like to. Currently, I eat apricot or apricot-pineapple preserves, purchased from the store. Yum! our friends in Savannah had 3 pear trees, each year my mother made pear pies, pear preserves, stewed pears. and i love them all. Some of my favorite memories are of canning and freezing for the coming winter...loved reading your memories here. Thanks for the "shout out". I enjoyed reading your childhood memories again, and can't wait to check out Kendra's blog!